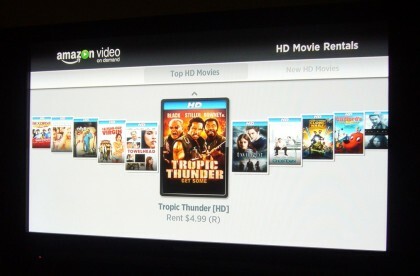 Dave Zatz: Two years after launching “Unbox” on TiVo (~$250), Amazon (AMZN) has finally rolled out HD video on demand. Early reports from various sources indicate excellent quality. Mari Silbey: Adobe’s announcement to bring Flash to the living room is undoubtedly the biggest news out of this year’s NAB show. While much of the focus of the annual event put on by the National Association of Broadcasters goes to the business of producing content, there are always a few flashy tech demos in the mix as well. Mari Silbey: Get used to it. We’re going to be talking about bandwidth caps for a long time to come. To sum up the latest happenings, Time Warner Cable sparked fresh outrage with the recent news that it would be testing consumption-based billing beyond Beaumont Texas. Dave Zatz: Later this week, Digeo will unveil two interest-free Moxi HD DVR ($799, no fees) payment plans. While I would have preferred to see a straight up price cut, this may may reduce the sticker shock for some and/or make the device more accessible.